It could be that to be ‘boring’ or cause boredom for others would be the worst character traits to have in this 21st century. Last century, (doesn’t that sound a long time ago?) as my children were growing up, the label ‘boring’ would create the same feeling of parent inadequacy and anxiety in me as, ‘there’s nothing to eat’ or ‘we never do anything’. ‘Boring’ for me, has always been an emotive word. Even though I knew that I was being manipulated it still worried me that there was more that I should be doing for my children to keep their minds busy. One of our ideas was to do without television for ten years! This was our attempt at making them find ways to amuse themselves. I’m not sure if it worked. They went to their friends’ houses and watched television there. I have read that the antidote to boredom is curiosity. Are there some people who are naturally more curious than others and interested in a range of things? One of the most inquisitive people I know is my nearest and dearest, my husband. My learned partner has spent most of his adult life studying. Some of his studies relate to personal interests and others are associated with work. He doesn’t read just one book, he is generally reading at least three. Yet, because he has no interest in football, cricket or any other sport but adores classical music and opera some people may find him hard to relate to. They might even think he is ‘boring’. How did he come to be so motivated to pursue his interests and want to know more? He has four other siblings and even though they are all very different every one of them is a lifelong learner. How did they acquire this inquisitive trait? Was it the freedom that they had as children living on the edge of native bushland and spending most of their days outside? Was it all that ‘unstructured play’ where they pursued their own interests and learnt by doing? To be a ‘quality teacher’ employing pedagogies for the 21st Century one of my first priorities is to ‘know’ my students so that I can tap into their interests when I am designing their learning experiences. Why? Because if they are unable to relate to what they are learning, they will be disengaged and worse still, ‘bored’! And there’s the rub. Our students, on the whole, do not have many interests. As teachers we constantly strive to help them to want to know about things beyond their own little world. Many of the students at our school generally don’t have the freedom to roam and they are not exposed to different people and places. After each holiday when we ask them what they have done, most of them have just stayed home playing computer games or watching television. If they do go out it is mainly to the shops. We spend a great deal of lesson time trying to introduce them to a larger world than their own suburb and to different times in history. We have to ignite their sparks of interest so that they will ask questions and want to know more. 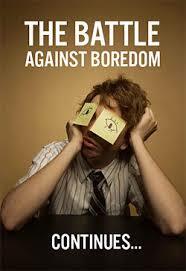 As one teacher says, “Our students are blank slates, they know so little.” And some of them are so easily ‘bored’. It has been exciting to see our students grow in knowledge and confidence as our school has embraced new ways of helping them to learn. Our aim is to help our students to be lifelong learners and to develop their curiosity about this amazing universe that we live in. We want them to be employable, valuable citizens of this world who care about others and contribute positively to their community, even the global community. If we don’t, I fear that they will grow up being ‘bored’ and that they will find anything that doesn’t relate to them personally, as ‘boring’.